Here are a few things to think about when researching Dementia Caregivers. A person living with dementia is very vulnerable because this degenerative disease affects almost every area of their lives, right from when they wake up in the morning to when they go to sleep at night. It is a very difficult time for them, and even more so for their caregivers. The disease is quite common, meaning that the number of dementia caregivers is on the rise. According to the Centers for Disease Control and Prevention (CDC), between 25-29% of caregivers of people age 50 or older provide assistance to someone with a cognitive problem, memory problem or dementia. Dementia caregiver playing a jigsaw puzzle with senior woman. The CDC also states that the vast majority of individuals with Alzheimers or other forms of dementia (about 87%) are cared for at home by family members, while about 10% of dementia caregivers do so long distance. Caring for someone with dementia is highly stressful, and it is totally understandable that family members may seek the assistance of professional dementia caregivers to help provide quality care for their loved ones. Caregiving for dementia may be divided into early-stage caregiving, mid-stage caregiving or late-stage caregiving. Dementia is continually progressive, meaning that it generally tends to get worse with the passage of time. As such, those in the early stages of dementia do not have the same level of cognitive degradation as those in the mid-late stages of the disease. It makes perfect sense that the level of care required is different in all of these stages. People in the early stages generally do not require quite as much care as those in progressed stages of dementia. No matter the stage or challenges involved, Elite Senior Home Care’s highly trained caregivers are here to help you every step of the way. 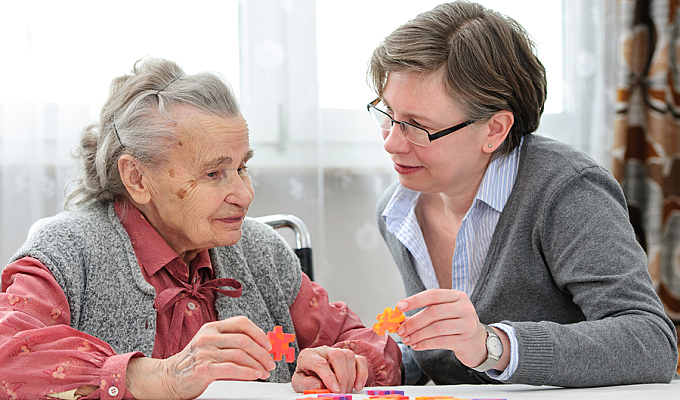 Even though the things a person with dementia used to do before with a lot of ease now become increasingly impossible to do, Elite Senior Home Care’s dementia caregivers will help your loved one maintain their dignity and independence as much as possible. Since each individual’s situation is different, Elite Senior Home Care works with each family to customize dementia care plans for the individual. We understand there is a lot of frustration associated with caring for someone with dementia, and we work with families to relieve the emotional frustrations that come with dementia-related disorders. This allows families to concentrate on the things that matter the most, knowing that their loved one is in trusted and capable hands.